Like many vacationers who fly into Honolulu International Airport getting through a new terminal is important if you want to get to your destination and start your Hawaiian adventure. Hawaii is one of the most beautiful locations to take a vacation as well as find yourself doing important work for your company. Whether you're checking in or checking out, the Honolulu International Airport knows how to greet a guest well. Known for being one of the busiest in the world, the facility moves millions of passengers every year, but with exceptional guest services alongside exclusive shops and eateries, something's bound to catch your interest. 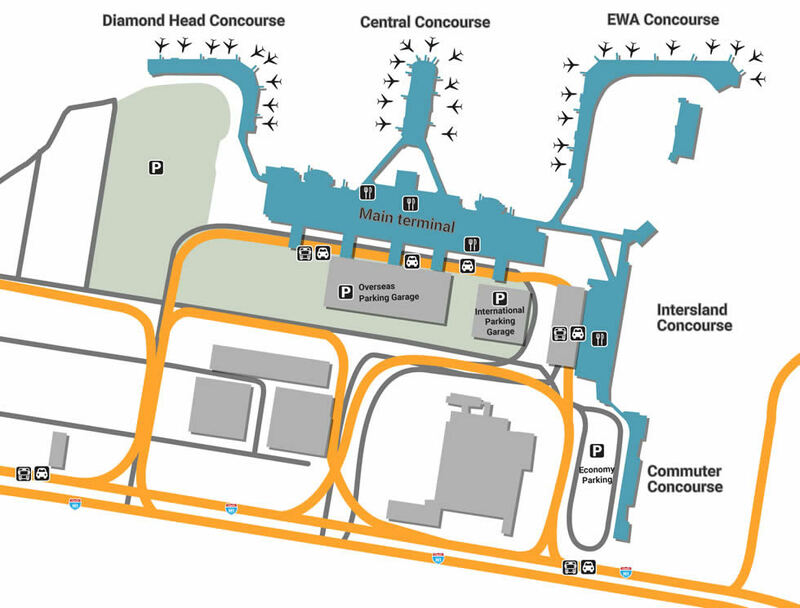 Honolulu International's parking is expansive and close to the airport. For those picking up passengers, the Cellular Telephone Lot allows a one-hour grace period. Lot A, otherwise known as the International Parking Garage, is located adjacent to Arrivals on Airport Access Road - with a 30-day parking limit, it's a great place to park for a few days. Long-term travelers should utilize Lot B, the Economy Lot, for an even better rate as well as free shuttles to the airport. The Overseas Parking Garage, located at the Parking Plaza exit H-1 Freeway East, is open 24 hours a day, offering prime access to the Main Terminal on the fourth level. With a variety of helpful services scattered across the facility, there's plenty to be grateful for when you arrive to Honolulu International. There are on-site storage lockers provided by several companies, including Aloha Airport Delivery and Hawaii Self-Storage. If you're in need of a currency exchange, visit one of the many exchange booths located at Gate 12, 25, as well as the International Arrivals Areas inside of U.S. Customs. For military families awaiting a momentous occasion, enjoy the USO lounge, open 8 a.m. to midnight and located between Baggage Claims E and F.
Shop until you drop when you come to Hawaii, something that's easy to do when you see the unbelievable stores available. The airport is a great way to dip your toes into the city's stylish water, especially at the main shopping strip at Main Terminal 3. Play with upscale accessories and wardrobes at Ralph Lauren, COACH, and Marc Jacobs, making every moment a beautiful one. For lovers of privacy, pick up a pair of state-of-the-art headphones, turning every flight into an oasis by visiting the Pandora store, located outside of Gate 24. Any negative can easily be spun into a positive, so long as you want it to be. Make sure nothing burns you out by taking hits in stride, something that can easily be accomplished with a tasty sandwich from California Pizza Kitchen, located in the Main Terminal food court. For classic American-style snacks and coffee beans that comes straight from the island, visit Makai Plantation, located between Gates 49 and 53. Looking for a cold one in an isolated place? Then visit the Gordon Biersch Brewery (Gate 28), offering a great view from Terminal 3's Ewa Concourse as well as unique microbrews.